Portland has grown by almost 30,000 households since the year 2000. The Housing Bureau says we need 24,000 new units to be built yesterday to meet the demand. This influx has caused an escalation of rents in the city-core. Average annual rental increase is over 14%, but near the center (where transportation and services are most accessible) there are increases many times that. In my neighborhood, in inner-North Portland, a studio apartment starts at $1350. A large percentage of even gainfully employed people cannot afford this city. Having attended multiple housing seminars by city/county experts, I have heard solutions from creating dormitories in the city’s periphery to building tiny house neighborhoods. Instead, we need to incentivize Portland homeowners to do what contractors are encouraged to do: Build UP. The inner-core of Portland is covered with detached single-car garages, many in ill repair. There are almost 300 such garages within 3 blocks of my home (I live 2 blocks off the Yellow-Line and 5 stops from Downtown…perfect for density housing.) The city/county could create an incentivized and streamlined process to help homeowners demo their detached garages and put a second story with a small studio. Take the best of Tiny House technology and apply it to garage studios. Many Portland homeowners could be highly motivated to add another living unit to their property; some because they are socially conscience and others desire investment value. Either way, the motivation is there, but it is untapped. Building a tiny loft includes a list of expenses including architecture, engineering, permitting, labor and materials. The list is formidable and total tens of thousands of dollars. My wife and I are currently installing solar (also out of social concern. We are not contractors or engineers, but we signed up for a service that coordinates the entire process (engineers, designers, roofers, electricians, installers, bankers), so much so that we cannot believe how hassle-free the process has been. The city/county could provide just such a curated service to simplify the process for homeowners. The fast majority of us are not contractors or builders and the thought of adding a studio apartment is akin to being asked to build a space shuttle. The secret gut check of ADUs, is that as soon as they are completed, the county comes in a significantly raises property taxes in light of the extra unit. I have heard stories as high as doubling the already high county tax. Any homeowner who takes advantage of this program to build a Tiny Loft at the affordable cost (and process) that the city/county provides, will agree to a rental price freeze as set by the program. For instance: A 5-year commitment to set the price at $450/month. With a program that streamlines costs, a homeowner could still be cash positive/neutral (while financing the remaining costs) over that 5-year period. After the period ends, the homeowner could then place rent closer to market value. Homeowners could also be required to rent the Tiny Loft to a lower income or working class person, but that would require additional administration, unless the homeowner is simply required to keep income documentation of renter on file. · Accountability that Tiny Lofts are being used according to the program. 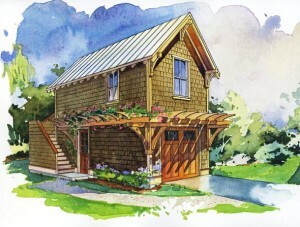 Consider partnering with local Tiny Home companies for designs and management. What if Portland could become a magnet for the Tiny movements? Let’s add Tiny Lofts to the list of ways that Portland already leads the country: urban design, public transportation, bike culture, food carts, arts and design. Partner with local contractors to do the work. Help them to perfect their process to lower costs to homeowners. Each partner could be required to hire a marginalized or home-insecure person as an apprentice for this program. Each Tiny Loft requires a wide range of contracting skills and would be the best classroom. Prioritize minority owned contractors. Partner with Tony Jones, Executive Director, Metropolitan Contractor Improvement Partnership. Partner with local universities with architectural programs for plan design.